From parrot acupuncture to rat migration to venomous lionfish, student researchers and scientists from around New York City bonded over prickly and poisonous research topics at this year’s annual Bronx Science Poster Session. The Sept. 30 event, held at the Bronx Zoo, was a collaboration of the five-member Bronx Consortium, consisting of the zoo, Fordham, the New York Botanical Garden, Montefiore Medical Center, and Albert Einstein College of Medicine. For many of the researchers the event served to update fellow participants on the status of ongoing data collection and results. For Matthew Combs, a graduate student at the Calder Center, the event marked the end of data collection on rat migration in Manhattan. “We pretty much covered the whole island and finished yesterday,” he said. Combs’ work was part of a large study headed by Jason Munshi South, PhD, associate professor of biological sciences, one that garnered much press attention over the past year. The team collected rat DNA from all 41 Manhattan zip codes. Among the many findings was that rats, like their human counterparts, tended to stick around their own neighborhood until it got too crowded, after which they moved on to other locations. Is Acupuncture for the Birds? Many of the research studies, like Combs’, collected hundreds of samples, whereas others presented a single case study. 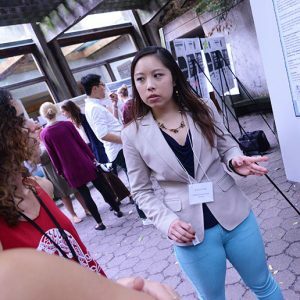 Jessica Chin, of the Wildlife Conservation Society (WCS) at the Bronx Zoo, presented a case study of a 15-year-old parrot whose claw hock was swollen and beleaguered by arthritis. After trying a variety of meds for three months, including anti-inflammatory drugs, the parrot showed no signs of progress. The researchers turned to acupuncture instead. Chin said that the use of acupuncture is limited at the zoo because not all animals are agreeable to being poked. She noted that tigers are not as amenable as ostriches. She said that even the ostrich had to be coaxed into the process. However, the ostrich also showed improvement, she said. 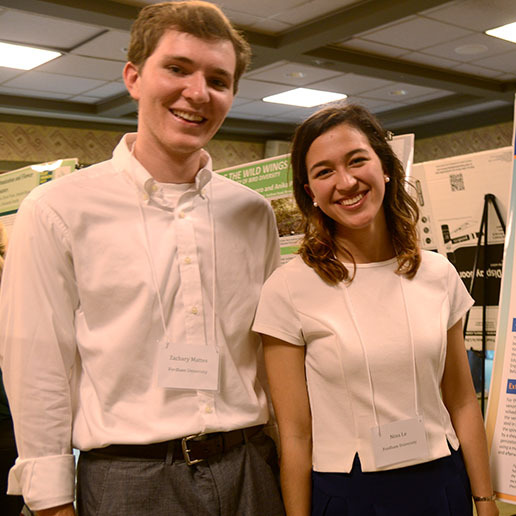 Fordham College at Rose Hill Juniors Zachary Mattes and Nina Le clocked more than 500 hours at the lab this past summer studying the genome code and proteins of the venomous lionfish. Paul Smith, PhD, supervised their research. “Aside from the ecological impact, it’s an obvious danger to humans,” he said. The two are using chromatography to isolate the two proteins that cause the neurotoxic effects. They plan to continue research of the protein structure of the venom through crystallography. “This is only the beginning,” said Le. Alongside the graduates and undergraduate researchers, high school students from Project TRUE, the urban ecology field research program, also presented their findings. Project TRUE pairs Fordham biologists with WCS educators that work together to train teens during the summer in areas that promote interest in Science, Technology, Engineering, and Mathematics (STEM). Valerie Pierre-Louis, a student at the Lycée Français in Manhattan, said that Project TRUE taught her how to communicate science to her peers. There’s also a benefit in meeting other researchers, students said.